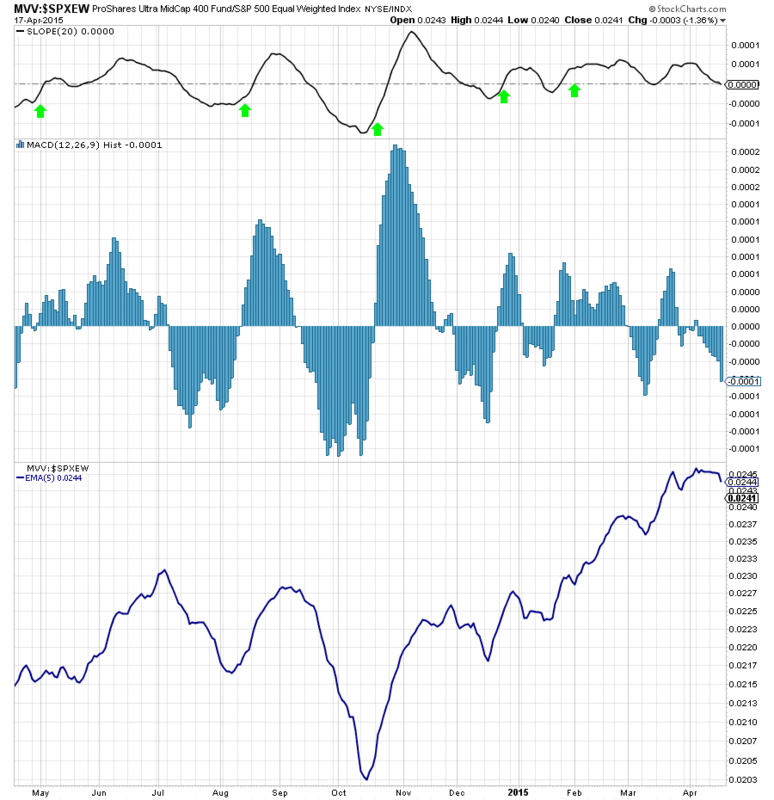 April 18, 2015 – Welcome to my weekend market comment, an analysis tool I use in my own portfolio decisions, published free to the web every weekend before the New York opening bell. For full details read my disclaimer below. U.S. stocks closed sharply lower on Friday, following negative news that sent overseas stocks lower, as investors looked ahead to a heavy week of earnings. The major indices had their worst week since the one ended March 27, closing down about one percent for the week. The Dow Jones industrial average fell 357 points and dipped into the red for the year before coming off lows in the close to eke out a gain for 2015. The Dow Jones Industrial Average closed down 279.47 points, or 1.54 percent, at 17,826.30, with American Express falling nearly 4.5 percent to lead all 30 blue chips lower. The S&P 500 closed down 23.81 points, or 1.13 percent, at 2,081.18, with consumer discretionary and information technology falling nearly 1.5 percent to lead declines in all 10 sectors. The Nasdaq closed down 75.98 points, or 1.52 percent, at 4,931.81, with Apple down about 1 percent. Bloomberg terminals suffered an unprecedented global outage on Friday, disrupting trading from Hong Kong to London and paralyzing investors for whom its screens have become the central nervous system of finance. Greek Finance Minister Yanis Varoufakis met with IMF officials on Friday, as investors became increasingly nervous about the funding crisis in Greece. Chinese exchanges and regulators announced Friday that they would crack down on over-the-counter margin trading and that they would allow fund managers to lend shares for short-selling. The type of stocks that investors can short sell will also be expanded soon to 1,100, from 900 currently. All of these moves could slow Chinese equities' wild run higher in recent months. I think you have been reading in my comments all this month I have been saying that stocks would march higher and find an excuse to sell off about the 20th of April. Well folks Monday is the 20th of April. Welcome to another sell in May ... ding! right on time. Of the three excuses for this sudden "revision to the mean" the only new one is the new rules for Chinese speculators ... many of whom see little difference between the Chinese markets and tossing dice in Macau. Exactly what is it the Chinese exchanges and regulators are worried about? Well last month alone, there were 4 million new margin accounts in China ... imagine in one month a new investor base the size of Los Angeles piled into Chinese equities. Worse Bloomberg categorized nearly 6% of new Chinese stock investors as “illiterate.” and nearly 60% have not even received a high school education. This market has nearly doubled in the space of 8 months on the back of margin debt that can now be measured as a percentage of GDP and volatility is at a 5-year high. Actually if you want to be concerned about something, I think in the long run this video tucked away on CNBC is a much bigger worry. Long Term Debt. 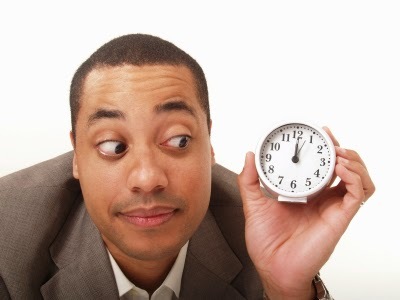 That said, I was able to predict this sell off weeks before this news, so in my opinion it is not (as CNBC would tell you) due to these mysterious market forces, it is simply late April and time for prudent mangers to take profits and lighten up on their positions. 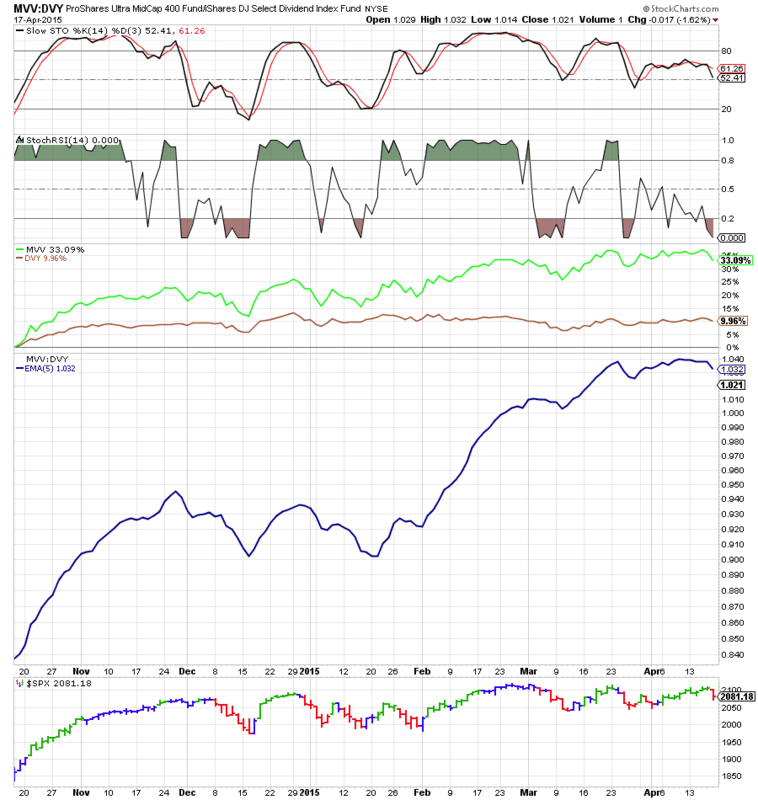 We have become overbought, thus the pros know the current prices are not sustainable. As we go through the charts I will show this and refer back to the news stories above as "market forces". Well here is our first example, notice that the light green line (the four day average) can only get so far from the 50 day trend and not revert for a minor pull back. As you can see the market was due for a sell off more than it was worried about the above mentioned "Market Forces". 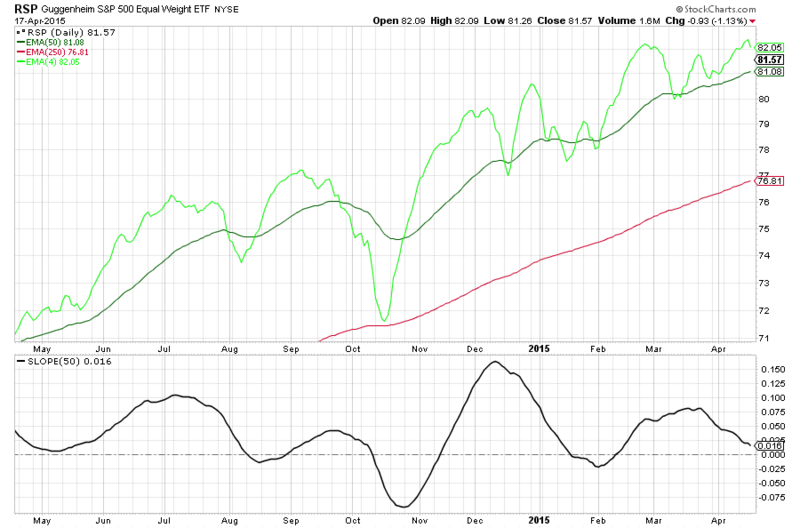 That said, the main lesson of the Bull Bear Lines is... are we in a Bull Market and the answer is YES. So when the market pulls back in a Bull Market 9 out of 10 times it is an opportunity. This being the cusp of May it should be a bigger pull back than the recent ones. Looks like the smart money got caught the wrong way as the week ended and now they can't wait to buy insurance. Expect this to continue down for a while. As the markets declines high-beta stocks get beat up worse. 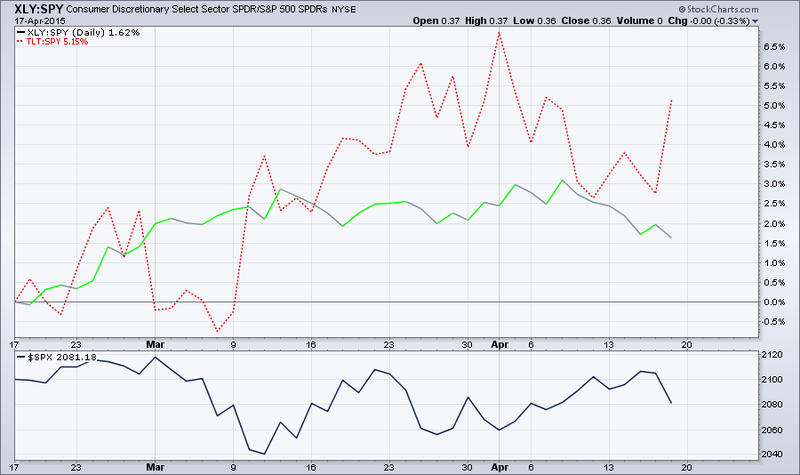 Well bonds did better than equities which pulled back Friday. Last week I called this a classic up-turn but in fact it fizzled. Last week I said that this concerns me as the market is turning toward big stocks over mid-caps just when it should not. As it turned out dear readers, this was prophetic. Clearly this is NOT a good time to put new money to work in the market. 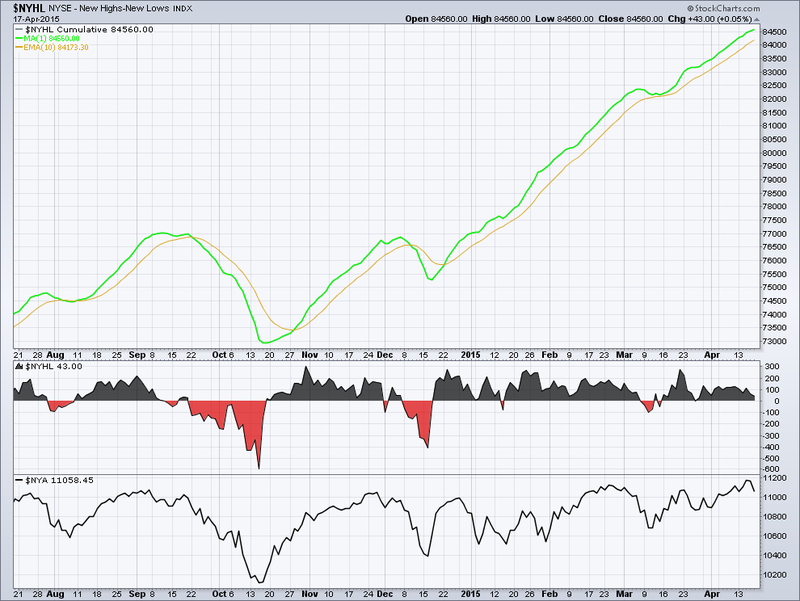 Another whipsaw over last week as tech gets hurt in the sell off. 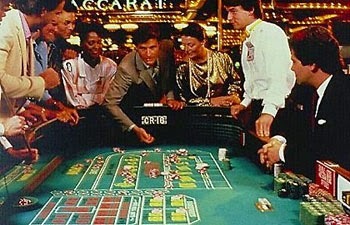 Last week I said that "The Message here is the money is returning to the market but it is in the big name safe plays." 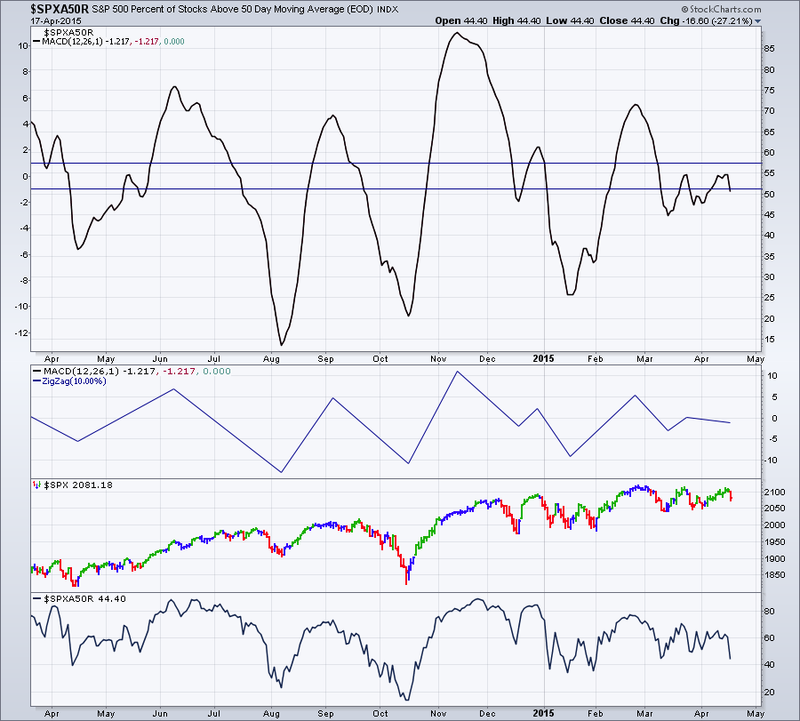 Again another small warning sign that the rally would not hold. This chart mirrors what the Aggressive Defensive Chart says. Last week we worried that the new trend is safer stocks like the defensive ETF. Again a nice tip off. As you can see the market was due for a sell off more than it was worried about the above mentioned "Market Forces". On Balance Volume is keeping pace with the current market. A great relief as smart money is still with this market. Remember most people loose money in the markets and a select few make all most all the profits. This is the smart money so it is important that it participates. 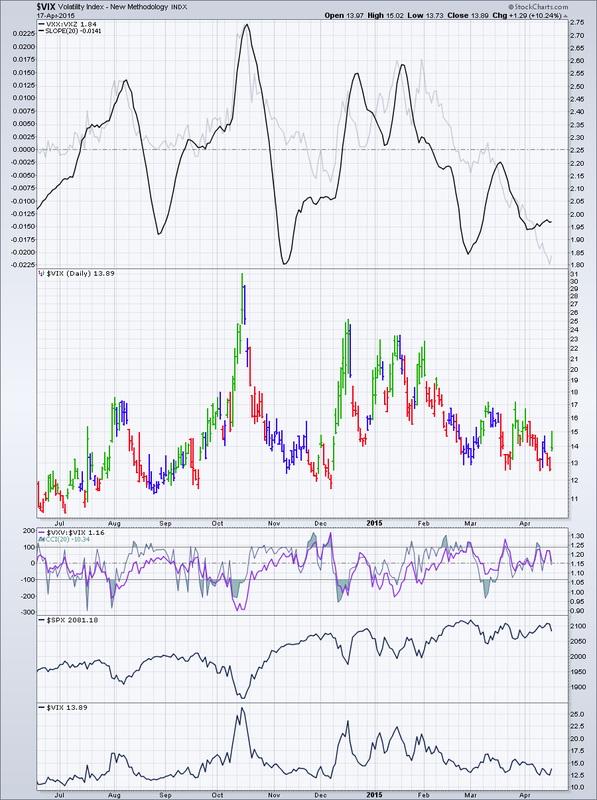 The CBOE Volatility Index (VIX), widely considered the best gauge of fear in the market, traded near 14. 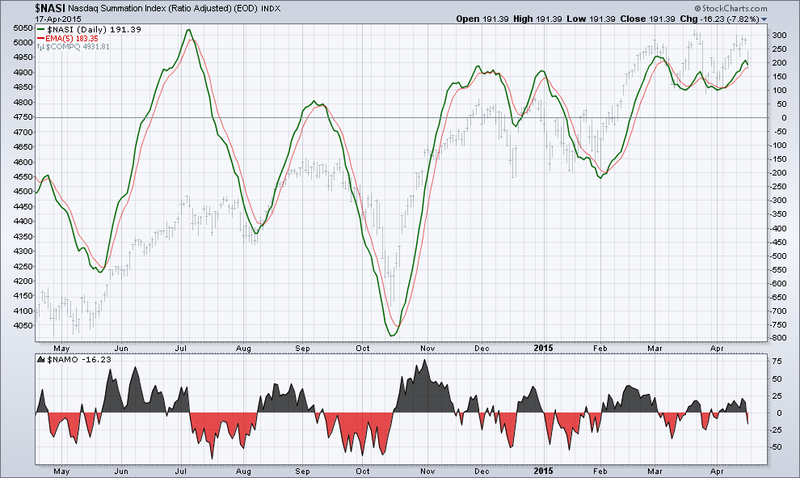 As you can see the chart hit the edge of the "normal range" and now fear is returning to the market. As you can see the market was due for a sell off more than it was worried about the above mentioned "Market Forces". 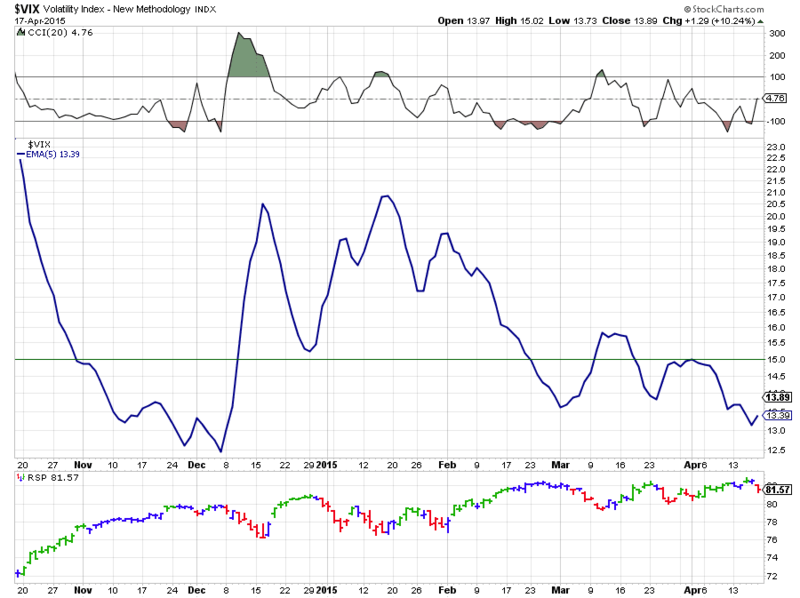 Don't forget this is an experimental VIX indicator... Last week I said, "my look how close I am to the edge of my range.....In other words it looks like a run up for a short term and then boom back to a sell off." As you can see the market was due for a sell off more than it was worried about the above mentioned "Market Forces". Now if you want to have the cr@p scared out of you then here is the graph to do it. I don't normal show this graph because normally it says the same thing every week. 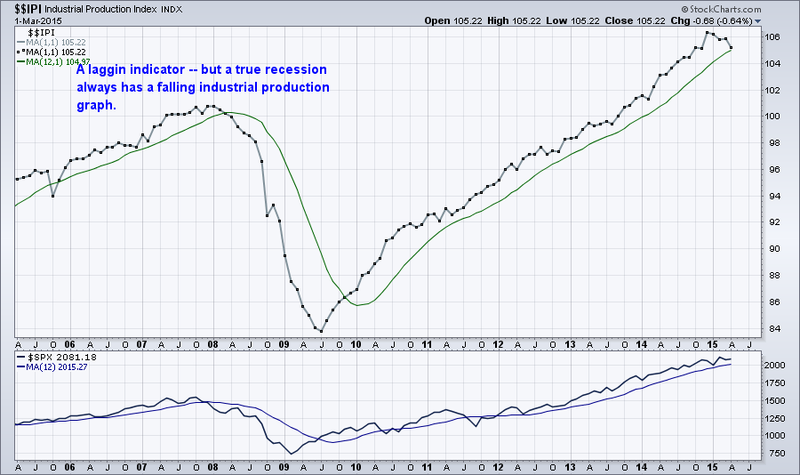 Industrial Production always falls off in a recession, although often this graph tells you way too late. We have not seen a downturn in this chart since the "great recession". 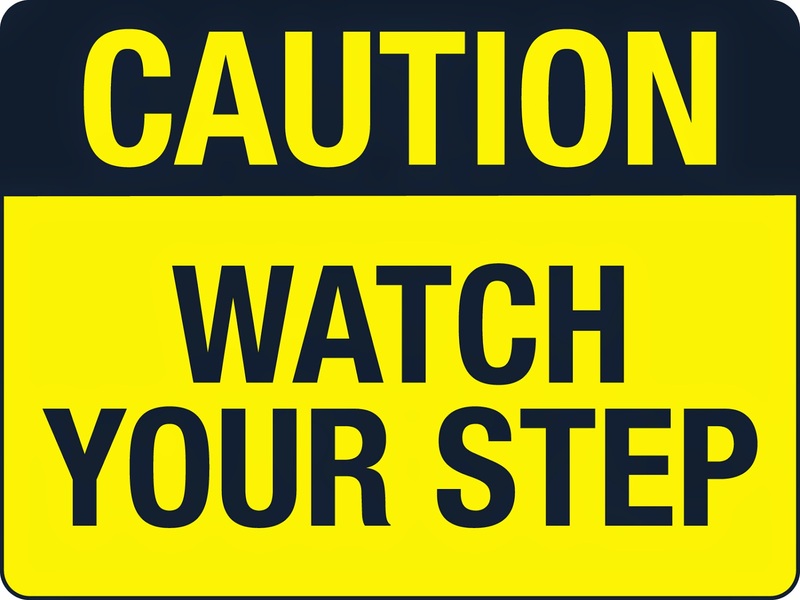 Don't forget the unskilled investor worries about how much they can make --- the pro worry about how much they can loose, Here are two videos that explain why. Summary We are still in a bull market have begun a pull back. It will be a good time to be long. that said I have been saying for weeks, volatility is making me use safer bets and be less aggressive. Until the trend is stronger I don't recommend any hero plays this well could be a long term topping pattern, although I doubt it. The forecast: RAIN. Raise some cash, sell your volatile stocks, mild hedging. Lets keep an eye on that industrial production.